The program director has the primary responsibility for monitoring fellow competence, for recommending promotion and certification, and for recommending remedial or adverse action. Fellows are evaluated with regard to their adherence to cardiology fellowship policies and their progress toward meeting the curriculum goals and objectives. 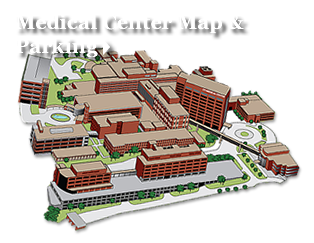 Additionally, fellows are expected to comply with both University of Tennessee Medical Center (UTMC) and University of Tennessee Graduate School of Medicine (UTGSM) policies including but not limited to: personnel policies (including sexual harassment), Code of Conduct policies, infection control, completion of medical records, and federal health care program compliance policies. A portfolio is maintained for each fellow. It includes copies of faculty formative and summative evaluations, self-evaluations, scores from any in-training examinations, presentation materials (such as handouts or slides) created by the fellow for his or her presentations, evidence of fellow PI and scholarly activity, fellow conference attendance summaries (updated at least semiannually), procedure log summaries (updated at least semiannually), and any other materials on which the fellow would like to be evaluated (such as an interesting case file or file of articles). 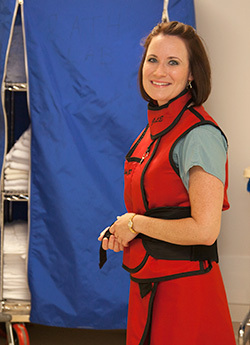 At the end of each rotation, fellows are evaluated by their supervising faculty physicians using a global evaluation that is based in part on focused observation and evaluation of fellow performance of required procedures and skills and is also based in part on the degree to which the goals and objectives for the rotation have been satisfied. A copy of the global evaluation is forwarded to the Graduate Medical Education (GME) office. Faculty supervising physicians in continuity clinic solicit input from other faculty regarding fellow performance in cardiology staff clinic and complete a global evaluation of fellow clinic performance. The evaluation is based in part on semiannual evaluations of the fellows by the clinic nurses and patients. Each fellow is evaluated using a modified 360-degree evaluation, with feedback from peers, nurses, and patients. The program director solicits feedback on fellow performance from other faculty, reviews the fellow's portfolio and file (including the procedure log and conference attendance log), evaluates the fellow in writing, reviews with the fellow his or her performance summary, make recommendations to the fellow for improvement, initiates any required corrective action plans, and recommends and initiates the process of making necessary or desired program changes based on fellow feedback. If, taking into account faculty input and acting in accordance with program and institutional policies (including the institutional policy regarding Academic Due Process), the program director decides not to renew a fellow’s Letter of Agreement, the program director must provide the fellow with a written notice of intent not to renew the Letter of Agreement with as much advanced notice as circumstances reasonably allow (if possible 4 months prior to the end of the Letter of Agreement). At the end of each year, with faculty input, the program director makes a formal recommendation regarding fellow promotion, graduation, remediation, or non-renewal. The program director records his or her recommendation in writing on the semiannual fellow evaluation form, a copy of which is forwarded to the GME office. The fellows will take periodic in-service training tests (i.e. Adult Clinical Cardiology Self-Assessment Program tests) to assess knowledge of ECG, cardiac catheterization, and echocardiography. At the end of 6, 18, and 30 months of fellowship training, each fellow completes a self-evaluation. The fellows are also evaluated by their continuity clinic attendings using the MiniCEX and a chart review. At the end of the fellowship, the program director completes a verification and reference form and forwards a copy of that form to the GME office. Upon requests, fellows may review their files, including faculty evaluations of the fellows but excluding peer and nurse evaluations of the fellows. Peer and nurse evaluations are kept confidential from the fellows being evaluated. All evaluations completed by the fellows are kept confidential as well. The Evaluation Committee meets at least semiannually to evaluate all fellows. Those fellows identified by the Evaluation Committee as possibly requiring performance remediation or adverse actions are referred to the Clinical Competency Committee for follow through. The Clinical Competency Committee may also meet on an ad-hoc basis if a fellow receives an unsatisfactory (or "does not meet expectations") evaluation relating to any of the competencies or if a fellow is referred to the committee by the program director because of marginal or poor performance. The purpose of the CCC is to review a fellow's record, discuss the fellow's performance, and make a recommendation to the program director regarding the fellow. The program director is ultimately responsibility for determining any performance remediation or adverse actions. Program policies are outlined in the fellow handbook which is reviewed at the beginning of the fellowship with the Program Director. At the end of each rotation, the fellow completes a confidential evaluation of (i) the rotation and attending, if completing a clinical rotation, or (ii) the research training and environment, if completing a research rotation. The evaluation is recorded online in New Innovations, the residency management software suite. At the end of each rotation, the evaluations are reviewed by the Chair of the Department of Medicine, who may address issues as they arise but in a manner that preserves the confidentiality of the fellow. None of the fellowship faculty, including the program director, has access to these evaluations. At the end of each 6 month period, the fellow may be asked to complete a confidential peer evaluation of another fellow. The fellow being evaluated does not have access to the evaluation. The program director uses the peer evaluation, along with faculty, nurse, and patient evaluations, as input into his semi-annual evaluation of fellow performance. The evaluating fellow's confidentiality is maintained at all times. At the end of each year, the fellow completes a confidential evaluation of faculty, program, and rotations, as well as a confidential GME program resident questionnaire. None of the fellowship faculty, including the program director, has access to these evaluations. Annually, the Chair of the Department of Medicine reviews these evaluations, as well as all evaluations of the fellowship program and faculty completed over the course of the year by trainees, including not only fellows but also internal medicine residents who have trained with the fellowship faculty, to compile a program evaluation summary. In a manner that preserves the confidentiality of the trainee evaluators, the department chair orally reviews the program evaluation summary with the program director, who uses the feedback to improve the program and faculty performance. 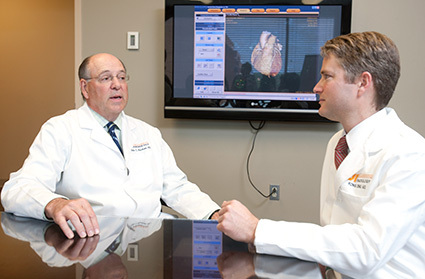 "The University of Tennessee Graduate School of Medicine Cardiovascular Disease Fellowship offered a rich and diverse training experience for which I am incredibly grateful. I enjoyed close mentoring relationships with distinguished faculty, the collegial atmosphere among the fellows, a supportive environment for research, and the opportunity to participate in a vast array of cardiac procedures."